DAMASCUS, Syria -- President Bashar Assad has traveled to Moscow in his first known trip abroad since war broke out in Syria in 2011, meeting his strongest ally, Russian leader Vladimir Putin. The two leaders stressed that military operations in Syria - in which Moscow is the latest and most powerful addition - must lead to a political process. Putin said he had invited Assad, thanking him for "coming to Moscow despite a tragic situation in your country." 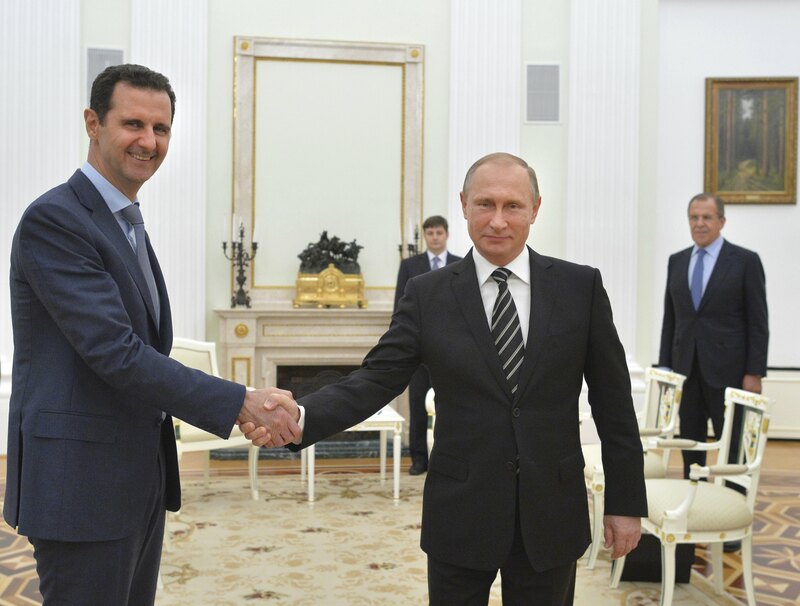 Assad flashed wide smiles as he shook hands with Putin and other officials. "We thank you for standing by Syria's territorial integrity and its independence," Assad told Putin. CBS News correspondent Margaret Brennan reports that the timing of Assad's visit to Moscow surprised many U.S. officials, particularly given that he left Syria in the midst of the regime's largest counteroffensive in months. A U.S. intelligence official referred it as a "photo-op with a failed dictator." The official said that U.S. intelligence finds it "interesting" that Assad chose to visit his patron in Moscow rather than his other patrons in Tehran as it "reinforces the notion" that he is "firmly under Putin's thumb." Brennan reports that the U.S. assessment is that the Assad regime faces long odds of a military victory and Putin is not one to bet on a losing horse. Yet the U.S. is still unclear as to how far Putin will go to support one man. As CBS News correspondent Mark Phillips reports, the visit was a clear sign of who's now running the show on the government side of the Syrian conflict, and it was a lot more than a simply courtesy call paid by Assad as Putin's jets have effectively become the Syrian air force. On Tuesday, the U.S. and Russia signed a memorandum of understanding over safety procedures for aircraft flying over Syria. The memo includes specific protocols for air crews to follow over Syria, and establishes a ground communications link. Late last week, as the final details were being negotiated, a Russian SU-30 Flanker jet fighter came within 1,500 feet of two American aircraft, the closest approach since Russia started flying airstrikes, reported CBS News correspondent David Martin. Syria's conflict began in March 2011 after the government cracked down violently on largely peaceful protests against Assad's rule. The protests gradually became an armed insurgency and a civil war that has killed a quarter of a million people in the past five years. Moscow, a traditional ally of the Assad family, started an air campaign on Sept. 30 against what it said are terrorist groups threatening Syria and Assad's rule. It became the latest international power to deepen its involvement into the increasingly intractable conflict that saw a mushrooming of armed groups, including the Islamic State of Syria and Iraq (ISIS) and al Qaeda. Putin said that along with fighting militants, Moscow believes that "a long-term settlement can only be achieved as part of a political process with the participation of all political forces, ethnic and religious groups." "The Syrian people have been putting up a fight against international terrorism effectively on its own for several years, sustaining sizeable losses but it has achieved positive results recently," Putin said. A statement posted on the Syrian presidency's official Facebook page said the meetings discussed the continuation of the military operations against terrorism in Syria, calling it the "obstacle" to a political solution. "Terrorism which we see spreading today could have been more widespread and more harmful if it weren't for your decisions and steps, not only in our region," Assad told Putin in remarks carried by Arab media. Commentators on Syrian TV hailed the visit as endorsement of Assad's legitimacy, reinforcing the notion that he must be part of a future political solution to the crisis. "This lightning trip is a slap" to Assad's opponents, Syrian analyst Bassam Abdullah told state television channel Ikhbariyah after the visit, adding that it highlights the need for political meetings not just military action. Abdullah described the meeting as "intimate" and reflecting a common vision and values between the two leaders. "There is a clear strategic shift in the region ... and it is happening fast," he said. Television footage showed footage of Putin and Russia's foreign and defense ministers meeting with Assad, with the two leaders exchanging warm handshakes and smiles. Syrian government officials didn't say if anyone traveled with Assad and photos from the meeting didn't show a delegation accompanying the Syrian leader. Assad said Russia's intervention was in line with international law and praised it as an effort to rid Syria and the region of terrorism. Putin's spokesman Dmitry Peskov, in comments carried by Russian news agencies, declined to comment on any specific outcome of the talks. Since June, Russia has played with the idea of a political transition that would envisage setting up some sort of interim government, and has discussed the issue with the U.S., Saudi Arabia, the Syrian opposition and others. Moscow's diplomatic efforts have brought no visible results so far, but Putin has insisted that a political solution for Syria remains his top goal despite the military action. He recently met with Saudi officials, staunch critics of Assad and supporters of the rebels fighting against him. Moscow also has sought to alleviate the concerns of Turkey, a major economic partner and the second-biggest importer of Russian natural gas, which has been critical of Russia's intervention in Syria. Ankara also supports rebels fighting Assad. Answering questions about Assad's visit to Moscow, Turkey's prime minister took a jab at the Syrian leader, reiterating his country's position that Assad should not have a role in Syria's future. "If only he could stay in Moscow longer, to give the people of Syria some relief; in fact he should stay there so the transition can begin," Prime Minister Ahmet Davutoglu told reporters. Davutoglu insisted that efforts to find a solution to the Syrian crisis should focus "not on a transition with Assad, but on formulas for Assad's departure." "With our support, Syrian government forces have turned from a retreat to an offensive, liberating a part of their territory from Islamic State militants," Shoigu said. "We are going to continue rendering the assistance to the legitimate Syrian authorities and create preconditions for a settlement of this conflict." A week after Russia launched its airstrikes, Syrian ground troops, aided by allied fighters from Iran and Lebanon's Hezbollah, pushed their way into central and northern Syria in an attempt to drive out rebel and militant groups in control of territories there. So far, Syrian forces have seized a few villages but there has been no strategic victory. Many of the attacks have hit western-backed rebels and al Qaeda's affiliate in Syria, but not ISIS, with its stronghold in eastern Syria. Dmitry Trenin of the Moscow Carnegie Center said that Putin's meeting with Assad signals Russia's willingness to seek a political solution in Syria - but on its own terms. "By summoning Assad to Moscow, Putin seeks to convert an early military success into political capital, by launching a political transition on his terms," he said.